What Happened To The NPP Poster Boy? Another political drama has been staged in the month of March. Indeed, much has been said in this first quarter of the year. Very much so! We've heard, the Ghana cedi is going downhill and would never recover, according to NDC financial gurus. We've also heard about the doom and the boom predictions concerning the economy and some personalities in the country. Remember the one about Sheikh Dr. Nuhu Sharabutu, Chief Imam, of Ghana? The man is already 100 years old. So what does death mean to him? The doomsayers had a similar message for ex-presidents Rawlings, Kufuor and Mahama. Thank God his mercies abound. And nothing untoward has occurred. We're still in March though, I must note. Meanwhile, the mountain climbers couldn't climb the Djebubu Mountain. And the man who said he'd already crossed the Pra River is still around. Boots unlaced and shirt unbuttoned. He's not going again! Don't be surprise, we're still in March. Some politicians will make many u-turns. Some will misfire and be fired. And some more will continue to run their mouths like 'Nika-nika'. Did he stay or did he leave? I thought he was long gone.In fact, many including me somehow, took his threat serious, albeit with slight misgivings. Kennedy Agyapong M P for Assin Central announced last weekend that he'd truncated his career in politics. The proverbial mouse took a bite of the cherry but failed to chew it. Was it bitter? Henceforth, I'll compel.all would-be-exiters to make this commitment:: They should text me if they want to make an exit either permanently or temporarily. Then they wouldn't come back and say for example: "I said it, but I didn't meant it. Indeed, the Ken political exit pronouncement seemed less like a Shakespearean plot. Red-eyed Brutus was on collision course with his boss Julius Caesar. However, this one appeared more like folklore legend--Kwaku Ananse's story. Lot of insinuations. Lot of aspersions and lots of drama amid threats of quiting and chest beating. I learned the feelings at both the NPP and NDC camps were mixed. The element of unknown had wrapped his heavy arms around a section of the people. Why? The Poster Boy had threatened to spill it all out. Let out anything deemed 'Amodin' (unmentionable).The alleged skeletons in the closet were to be unveiled. Who would have survived that onslaught? There was another group that weren't happy. Aparently, their darling boy was saying goodbye to them. Their concern: Who would speak for them? And yet there was a third tier. The jubilant group, I call them. Their joy had hit the moon. They jubilated over Ken's announcement that he'd had enough and was quitting politics finally. This group view Ken as 'Krotwamansa'. He's been a thorn in their flesh. Always on their nerves. So when they heard that he'd quit politics and wouldn't talk about politics any longer, they shouted hurray! But it turned out the 'goodbye' never was. Ken is staying put.He's going nowhere. 'Nanka eb3ye den na aye woya '. I guess the exit strategy wasn't glamorous. It turned out that the poster boy's constituents approached him and begged him to stay. The Brexit bug is biting auntie Theresa so hard. Time is running out for the UK Premier to take her country out of the European Union (EU). And as I put pen to paper she's already in EU's headquarters-- Brussels where the 28 flags of member nations are flapping like the Elephant's ear. Literally, she's found herself in a cesspool. Mama Tess triggered this process on 29 March 2017. This means that the UK is scheduled to leave at 11pm UK time on Friday 29 March 2019. And whatever the outcome might be..whether there's deal or no deal with the EU Britain will leave. So is Britain really leaving the EU? More likely so, but she can also choose to remain in it. Just like the way Ken rescinded his exit bid. Or the UK can ask for extention. Ah a friend just whispered into my ears that auntie Theresa has already done that. For the UK to leave the EU it has to invoke article 50 of the Lisbon Treaty which gives the two sides two years to agree the terms of the split. But I think it's all Boris Johnson's fault. He was the leading advocate of this Brexit thing. And now look! See how auntie Theresa is sweating. Jockeying to and fro. Trekking from the corridors of No. 10 Downing Street to Brussels.To say she's in hot waters is probably an understatement. Brexit has become her conundrum. Elsewhere in Ghana's Parliament House a parliamentary select committee chaired by Haruna Iddrisu was having a good laugh. Haruna had put members on stitches as he cracked them up with the governing NPP special initiatives list. In the dock metaphorically, was a minister of special initiatives designate. "The Presiden has many special initiatives they include: one village one dam, one district one factory, one constituency one million which of the initiatives are you responsible? "asked Haruna.
" Mr. Chairman I'll be responsible for the one constituency one million special initiative when I am given the nod.,"said the minister designate. Sorry, Madam Beautiful, I couldn't catch your name. Mr. Iddrisu interjected: " Where would you get the one million dollars?" The Minority Leader didn't seem to be serious. He let his guard down virtually .And the committee laughed hysterically. 'A'll work and no play makes back a dull boy. Hold on, I've got one more stuff to wrap up the match up. Did you know Uncle Tony Aidoo is gone rogue too? Problem is, I don't think this is the right time for the outspoken leading member to pick a bone with his party, especially after Elder Sammy's apocalyptic blues. I think Tony must let the sleeping dogs lie because the NDC aren't out of the woods yet. Instead, he seems to be digging into archives. Yes, Tony hadn't been happy with his party since 2000, a video on social media has revealed. "We're supposed to be social democrats for God sake. What do social democrats do,?" he rhetorically asked. "They consider policies and programmes that inure to the benefit of the wider and larger of the majority of the population rather than contribute to what's happening-- elections being a ritual for the circulation for elites ." According to Dr. Aidoo NDC never had time to discuss policies and programmes. All the party cared about was the election of leaders. "I stopped attending NDC. congresses as far back as 2000 because our congresses never extended to the discussion of policies and programmes. It was only for elections. 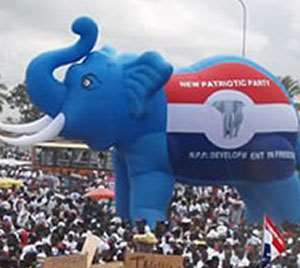 Election of party officials and Flagbearers.."Dr. Tony Aidoo said. Would the hawks in the party let him go unchecked or without reacting to his seemingly scathing remarks? That remains to be observed. This author has authored 261 publications on Modern Ghana. Did You See Moses etal..? What's Going On In South Africa? OPPOSITION ON EDGE: Is NDC finding itself at a loose end? ‘yahoo Boys’ In Police Grip: Are Our Neighbours ‘noisy’? Marine Drive Project: Is It A Dream Come True? The Change Storm In Ghana: Who’s Winning? Ec Money: Can Ndc Get Her Money Back?